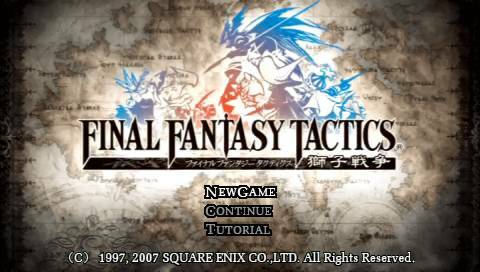 Final Fantasy Tactics Kind Of PSP (KO for short) is a gameplay improvement mod meant to make the WotL experience more enjoyable for those who have already beaten WotL and yearn for more. Unlike other mods, KO PSP doesn’t necessarily intend to make things harder- it does that by proxy, however, because skills, jobs, and items have been rebalanced to be less overpowered and more interesting. Instead of giving you boring blocks of text to read, here’s a run down some of the biggest features in KO PSP! 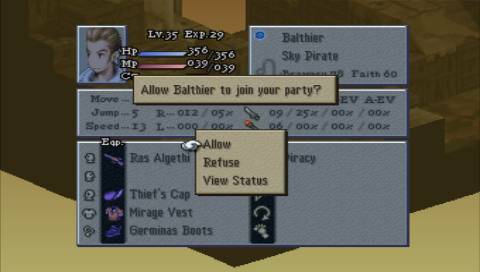 Multiplayer items and battles can be accessed (in one form or another) in single player mode. Levels scale with the player. Skills, items, and jobs have been rebalanced while keeping their original flavor. Luso and Balthier have repurposed skills, are no longer clones of other characters. Many anti-frustration features have been added, such as Errands only taking 1 day to complete, and all shops having the same types of items available, so you don’t need to constantly run to certain towns to buy certain items, and Treasure Hunts are all 100% finds. Basically, this mod was designed to be the definitive version of WotL that anybody can play and enjoy, whether they’re an amateur or a seasoned pro. Hopefully everyone will enjoy it! Note that in order for the patch to work properly, you’ll need to use a EUR ISO or else there’ll be bugs. Report any bugs to me immediately at ffhacktics.com where you can shoot me a message or post in the KO PSP topic. Thanks! This patch requires a EUR version of WotL to work properly. Please report any issues to me (Eternal) at ffhacktics.com!